Fix That Credit Score started in 2003 to help the clients who accidently damaged their credit ratings. A decade back, credit ratings were not as important as they are today, a poor rating can ruin your plans to start up your new business, buy a car, a house or even get a credit card. Most people do not do it intentionally, some face a challenging situation in life, some have a divorce, some have a loss of someone they love or a major accident. In such cases, no one bothers or even thinks about a bouncing check or a few skipped EMI’s. However, these issues make a permanent dent in the credit score unless they are taken care of. We are a team of committed professionals who do not use any illegal ways to fix the credit score, we use whatever legal ground we have and try to fix the score. Our high success rate allows us to charge the client upon completion of the task. We work on Equifax, Transunion and Experian credit reports to improve the credit score of our clients. There are a lot of people who do not understand that these simple and easy methods of perusing your application in a very professional manner can fix the credit score. A lot of people think that Section 609 disputes, ID Theft method letters, Fake Police Reports or any other fraud can be their last resort to fix the credit score. We totally disagree and never use these illegal black hat tactics to fix the credit score. These Fake tactics get your credit file locked for eight months. If you don’t understand what that means, it means that you cannot apply for a loan, get a credit card or any other credit assistance for that period. So, never take these risks when planning a new beginning in your life. There are a lot of 100% legal options to fix the credit scores and we use every single of them to restore your ratings and fix your credit limitations. Once the credit score is fixed you can resume your normal life, start a new business, buy a new home and there is no fee until we get these things done. We only charge for ‘What we do’ and ‘After we do’. This is the key to customer satisfaction, the legal processes take a while and our clients do not feel cheated during the wait because we do not charge anything upfront. When the credit score is fixed, we bill them and they are more than happy to pay. 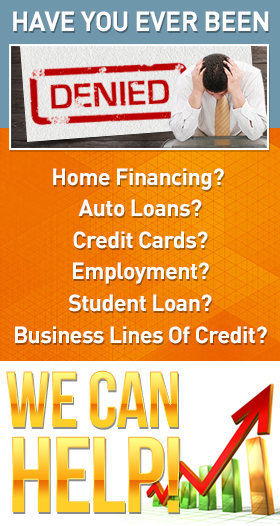 With more than a decade of experience in fixing credit scores, we know what best we can do for you. We do not promise false hope, but we work the facts as soon as you contact us and we inform you about whatever best we can offer. Our clients love our work ethics and transparent procedures. For More Details on Our Services and Offers you can visit the Services page. For further enquiry feel free to contact our offices. For contact details visit the Contact Us page. You can call or email our office between 10 A.M. to 6 P.M.